Faster assessment and easy adjustment. More active positioning. High performance to roll into action! The Invacare® Action3 has been designed to enable easier assessment, and adjusts for maximum mobility. The Action3 manoeuvres smoothly due to its light rigid and well-balanced frame, and an ergonomic design that enables the user to become more independent. 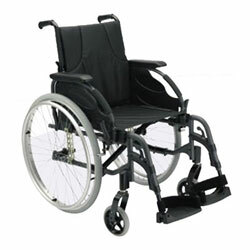 Improved function – Emphasis on user and therapist needs has resulted in easier and finer adjustments within the frame. These increased configuration choices ensure improved postural position maximising user function and independence. Performance – The Invacare® Action3 is designed to ensure optimal driving performance with the lightweight rigid frame and high quality components providing easy rolling and manoeuvrability. Functional – Adaptable and modular, the Action3 is ideally suited for accommodating progressive changes in user needs. It is also simple to refurbish with a range of options.